Home Android Nokia 7 Plus Review, Price and First Look | Should You Buy? Nokia 7 Plus Review, Price and First Look | Should You Buy? Nokia launched Nokia 7 Plus at MWC this year and it launched at a price point where it doesn't really have a lot of competition and from the looks of it, seems like a great smartphone. But I have been testing out the Nokia 7 Plus for almost 10 days now and this is our Nokia 7 Plus review, and let's find out its specification. 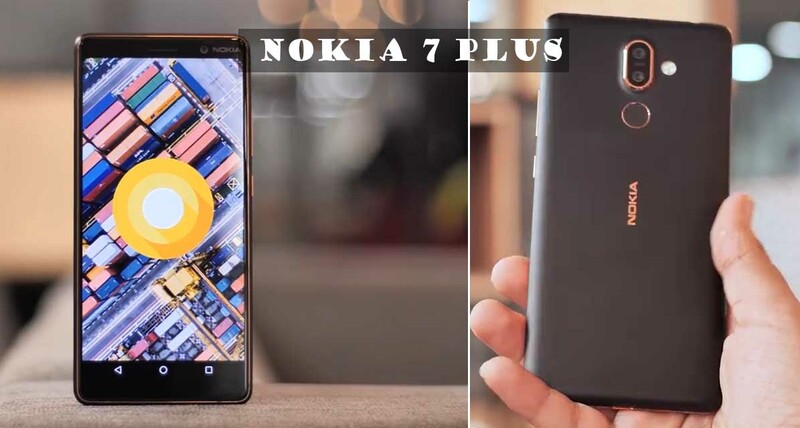 Nokia 7 Plus is a mid-range offering from the company and while that may be evident from its specs it's definitely not evident by its design. The phone looks premium & has a stylish bronze outline running around its sides and around the camera. It does not only look great, it feels great in the hand. Plus it's also built with Nokia using a solid block of aluminum with the ceramic peel coating that gives it a pixel like a feel from the back. The fingerprint scanner of Nokia 7 Plus placed at the right location other than that the device has much better buttons than what we show in the Nokia 6 and that's really nice to have. there also has a USB C port, the headphone jack is still here which is always nice to have. The Nokia 7 Plus is definitely a beautiful device to look at part of it is because of the 18:9 aspect ratio display, and it comes with a 6 inch full HD plus display and it's definitely a really great display, I mean the colors are nice and well-balanced visibility is on point and the display is definitely sharpened off plus since it's an 18 by 9 aspect ratio display it makes up for a really immersive experience and also makes holding the device quite comfortable especially considering that the Nokia has a massive 6- inch display I mean you still can't use it with one hand but it's not as big as a six-inch device would think about it. The Nokia 7 Plus comes with a 12 MP (f/1.75) plus 13 MP (f/2.6) dual rear camera with portrait mode 2X optical zoom and also comes with Zeiss optics which pretty great. The phone takes decent photos although it does over sharpen things a bit sometimes. However, when it comes to low-light photos the Nokia 7 Plus is neither here nor there, I mean it's not a terribly bad camera but it's not very good either. Thanks to the dual camera setup there's also the portrait and the portrait mode of the Nokia 7 Plus is good. The edge detection is usually good enough and it manages to blur out the background reliably well which is great. Sometimes the phone does screw up especially in low light but I'd still say that it's above average when it comes to the portrait mode. Well, the portrait mode on the Nokia 7 Plus is above average but below average is the video quality, the video quality of the phone just bad. I can't believe this phone has EIS. I'm not sure there's something wrong with the Nokia camera app but the videos are just horrifyingly bad. The front camera on the Nokia 7 Plus is decently good enough, it has a 16 MP (f/2.0) with Zeiss optic. Overall the front camera performance is pretty fine. The Nokia 7 Plus comes with Qualcomm Snapdragon 660, 4GB of RAM and the phone performs like a boss. It hasn't lagged out on me so far and it can easily handle everything I throw at it including PUBG. Most of the Indian variant of the Nokia phone comes with the stock Android program which something I really like. In the AndroidOne, you'll get timely security updates and guaranteed Android updates which are definitely awesome. Another thing that's awesome on the Nokia 7 Plus is the battery life. To be honest I was worried Nokia will put in like a 3300 mAh battery on this thing or something but fortunately the Nokia 7 Plus comes with a 3800 mAh battery. The device charge is like not insanely but fast enough. The device goes from 5 to 100 percent battery in one hour and 40 minutes, well that was pretty much it. The price of Nokia 7 Plus is Rs 25,999 in their official website. Undoubtedly the Nokia 7 Plus was a great smartphone. All the specification is decent enough but the price is a little bit expensive. Here, I try to show you all thing about Nokia 7 Plus. Now, if you like the Nokia brand, you must purchase it. But in the market, you got many good branded smartphone in this price range. So, if you like the articles then share also comment us, which part of the device you like most. Lastly, thanks to visiting our website.